It’s not often I get the chance – or have a reason, really – to cover pre-release footage, but… then something like this pops up. Pretty hard to ignore, ya know? And not just because I’ve been a fan of the Gunslugs series since its early days, although that is obviously part of the reason, but my goodness, the carnage! So many pixels just flying across the screen, as Orangepixel showcases what’s new and different in Gunslugs 3: Rogue Tactics. Groovy! By which I mean, new, different and subject to change, of course, seeing how this is recorded from an early alpha build. Even so, there’s plenty of fun happening in the series’ third entry already, for veterans and newcomers alike. One of the most immediate differences is a slower pace, making for a more tactical experience this time around, forcing players to stop and think more compared to the relentless run ‘n gun approach of Gunslugs and Gunslugs 2. 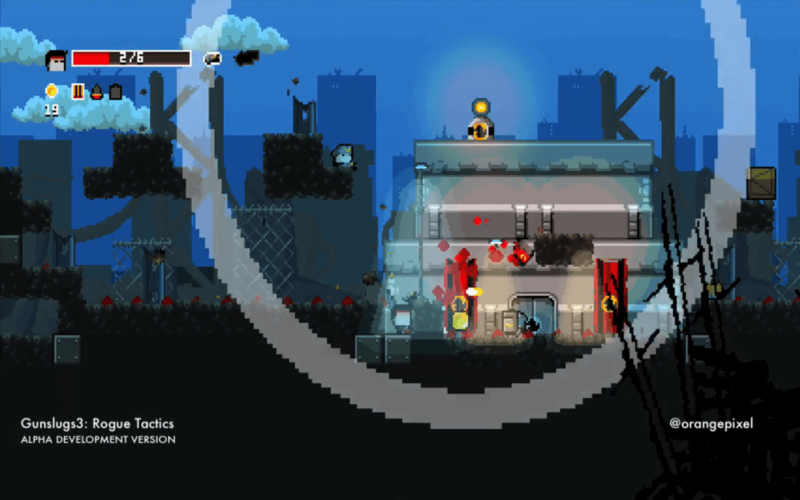 Adding to this, perhaps, is the fact that different characters actually impact how you play in Gunslugs 3, each featuring a unique play-style – among other things. I learned a lot of new stuff since Gunslugs, with the Heroes of Loot and Space Grunts games, and even the Meganoid2017 reboot had great idea’s.. so basically if you combine those things together, you get Gunslugs 3: Rogue tactics! So far, so semi-sequel, eh? Well, you know that old saying about how ‘the more things change…’? Holds true here too, as certain elements from the first title are actually being brought back! Remember the arcade cabinets? Yup, those things are coming back (unless the developer changes his mind between now and launch, anyway), along with… bits and pieces from another Orangepixel title (Meganoid 2017), apparently. All that and more can be read about in this here blog post, but not until after you’ve watched the video below in its entirety, ya hear? Long live the Gunslugs!